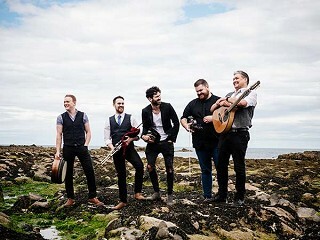 The band consists of five current and former members of the Celtic bands Manaran, RURA, Talisk, Barrule, Cara, Mabon, Mec Lir and The Lowground, all of which have collectively won titles including multiple BBC Radio Folk 2 awards. Talisk performed at the Sisters Folk Festival last September. Each member of the band plays a specific instrument for both of their bands while adding whatever the five-piece may need. All the members of the band grew up playing the same kind of music and being taught in school in various aspects of traditional Celtic music. They all had the same background in traditional Celtic music on different instruments. "Each member at one point or another moved to Glasgow, and because we all grew up around the same music, we found an affinity for playing with each other," said Mohsen Amini, concertina player and one of the leaders of the group. The group started playing in pubs together for fun and realized how well they worked together. "Pubs kept bringing us in as the five-piece and it just worked really well and we thought, why not try it out as a more official thing,"
Other members of the group agreed, and so once they sat down to play together officially, they released a video and they blew up. "We were a bit stunned, to be honest; all looking round at everyone else, thinking, 'is it just me or was that really good?'" said bodhrán player Adam Brown. All the bands, including 'mar, share the same manager so that things don't overlap with the five members' other bands and things stay consistent. "We play in all of our other bands at the same time as 'mar and have the same manager so we don't double book. It is a lot going on, but fun as well," said Amini. 'mar's sound is hard to pinpoint. They have traditionally composed Celtic tunes put together with octave pedals, no vocals and the various traditional instruments (concertina, bodhrán, fiddle, whistle, flute) arranged to be a super-charged, high-energy composition of music. "We compose the music ourselves and have a lot of themes of Celtic music just with a high level of energy in the tunes," said Amini. Amini said the dynamic in the group works well, and it doesn't take much effort to make the sound come together. "No one in the group dominates with ideas, it's all democratic, if one person doesn't like it, we change it," said Amini. Amini has been to Sisters before with his second band, Talisk, for the 2018 Sisters Folk Festival and looks forward to returning. "Everyone is super nice there and we couldn't believe the beauty we were seeing. I had never seen so many trees before," said Amini. The rest of the band has not yet seen Sisters and is looking forward to playing here as well. The set promises to be lively. "It is for sure dance music, you will start sitting and be standing at the end and singing along with some of our tunes," Amini said. 'mar will be performing Monday, March 18, in the Sisters High School auditorium as the third and final installment of the 2019 Winter Concert Series. Individual tickets are available through Sisters Folk Festival. For more information call the office at 541-549-4979.